By using the utility program FanucDataGui you can acquire and output information and performance related machine data from your FOCAS enabled Fanuc controllers. By using our configurable device driver for Fanuc controllers you can build and adjust your own customized driver based on all output of this program. 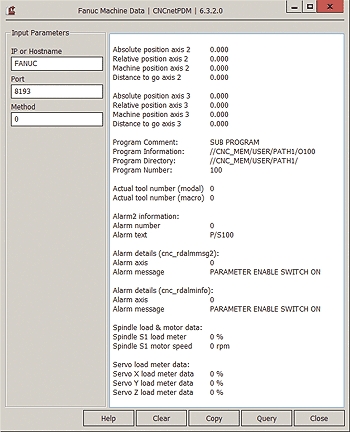 Important: If your machine has a PC that is connected to the controller via HSSB (High Speed Serial Bus) or if you’re using the HSSB features of FANUC’s NCGUIDE simulation software see notes on HSSB below. In these cases run the test directly on the respective PC! Tip: If you can access the controller via the network it is a good idea to use the program on a laptop with a network connection at the shop-floor in front of the machine. By doing so you can easily verify the results. If you have installed CNCnetPDM on your PC with a license other than a ‘free license’ and run this program from the folder where CNCnetPDM is installed you get unlimited output. Otherwise the program outputs a restricted set of items. Please see licensing for details or contact us if you have any questions. Note: If you like to run this program from a different location on your PC you can simply copy your CNCnetPDM.ini file to this directory. Extract all contents of fanucdata.zip to a folder on your PC. To verify that the controller is reachable you can open a command prompt (RUN->CMD) and type in ‘ping DNSNAME or ping IPADDRESS’ e.g. ‘ping FANUC’ in case the DNSNAME of the machine is FANUC. Verify that you get a response. In the first field on the left side enter the IP Address or DNS Hostname of your controller. In the second field you can adjust the port number if you configured FOCAS at the controller to use a port different to 8193 (standard). In the above example the controller replied which means that it is reachable and has the FOCAS option installed and enabled. If you get an error please look here to find out the reason. Clicking on button ‘Clear’ empties the output field on the right side. Button ‘Copy’ enables you to copy the data in the output field to your clipboard and paste it into a different program afterwards. Here you get information about your machine. Number of parts produced, queried via parameter 6711. If there’s no alarm FanudDataGui shows ‘No Alarm’ In case there is an alarm the program outputs the alarm number (0 - 15) and it’s description. Depending on the type of controller you get different descriptions e.g. 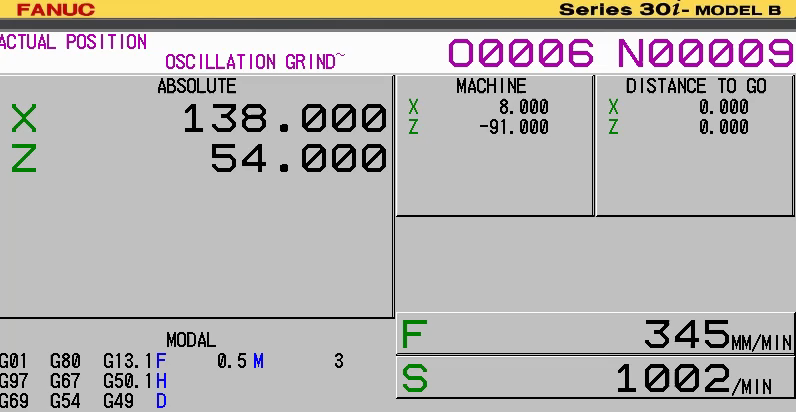 on a Fanuc 18i controller you’d see ‘P/S alarm’ if the NC Program got stuck an invalid G function. If your machine has a PC that is connected to the controller via HSSB or you use HSSB features of FANUC’s NCGUIDE simulation software the above procedure is slightly different. In both cases do NOT use the dll files starting with fwlib (e.g. Fwlib32.dll) included in fanucdata.zip. For HSSB on a real machine use the fwlib dll’s that the machine’s PC uses (search for them). For NCGUIDE use the following 5 dll’s that are installed by NCGUIDE: fwlib0DN.dll, Fwlib32.dll, fwlibNCG.dll, hssb.dll and mcnhssb.dll. For the test program instead of method 0 input method 1 for ‘Real HSSB’ or method 2 if you’re using the HSSB functions of NCGUIDE.